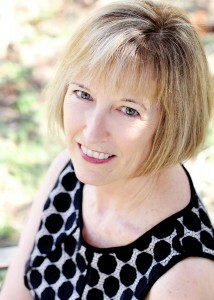 This month Austin SCBWI is honored to interview Anne Bustard, a longtime member in our chapter. With a heart the size of Texas, paired with her enthusiasm and love for children's literature, Anne is leaving her mark in Austin and around the world. 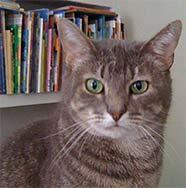 Her stories reflect her joyful nature and sweet spirit, (as do her famous iced sugar cookies.) We're pleased as punch to welcome her to our interview series. Where did you grow up, and did that place (or those places) shape your work? If so, how? Growing up, home was Hawaii-California-Hawaii. In the islands, I listened to the sound of the ocean as I drifted off to sleep, walked barefoot on the beach almost everyday, breathed in the sweetness of plumeria, pikake and ginger, ate rice every night at dinner, and lilikoi a.k.a. passionfruit shave ice as often as I could. I heard stories of Kings, a Queen, and a fierce volcano goddess named Pele. I took hula lessons once a week at Mrs. Beamer’s studio with my best friend Lei, and hiked to waterfalls in the verdant mountains with my cousins. My life was filled with an amazing number of blue-sky days. My only wish was that my California cousins and grandmother could have lived there, too. I moved to Texas for college and stayed, except for a one-year stint back in California. Without a doubt, Hawaii, California and Texas shape my work. All of my most recent manuscripts have a beach, or at the least, sand, and/or an amazing grandmother. Coincidence? Probably not. 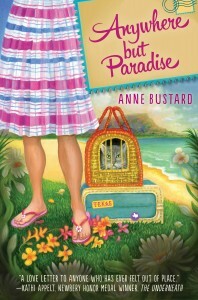 Last year, ANYWHERE BUT PARADISE, my debut middle grade novel was published. Set in Hawaii, Peggy Sue’s story is not my story, but echoes of my experience undoubtedly informed it. Hula lessons, stories of Madame Pele, a bully tradition at my intermediate school, tsunami alerts, the unbelievable natural beauty, Hawaiian music and more show up on the page. I love Hawaii. So it was incredibly difficult for me to cast it as the antagonist at the beginning of the novel. I was most relieved when that changed by the end. I’ve been an avid reader since forever! When I was young we didn’t do a lot of writing in school and it never occurred to me to write my own stories. But in seventh grade, my English teacher asked us all to do just that. I wrote a murder mystery (in which the butler committed the crime) and won a prize. In high school I wrote angsty poetry. Then, after taking a class in Children’s Literature at The University of Texas at Austin, where I reread old favorites and discovered new ones, I decided I wanted to write for children. It was many years until I even tried. But through my careers as a teacher, children’s only bookseller, and university lecturer (which is when I began to write), I kept up with the latest books and had the privilege of hearing many authors talk about their work. The truth is, I didn’t write because I was afraid to fail. And then, when I finally had enough courage to begin, I was terribly disappointed that my work didn’t sell. Now, I think, thank goodness! It wasn’t ready. Nor was I. Fantastic mentors, critique partners, SCBWI meetings, conferences, the Vermont College of Fine Arts and our writing community cheered and guided me all along the way. And still do. I love this question. And I have more examples than there is space to share. But here are a few. Early on, I tried writing all sorts of genres—picture books, early readers, and a novel. Next, I decided to write a picture book biography. But who would be the subject? Right around that time, a consulting job took me to Lubbock, Texas, for a few days each month for an entire year. Then, I knew—I’d write about Buddy Holly. So when my day job there was done, my research on Lubbock’s hometown hero began. Which of course included more than one milkshake at the Hi-D-Ho Drive-In where Buddy once sang on top of the roof. 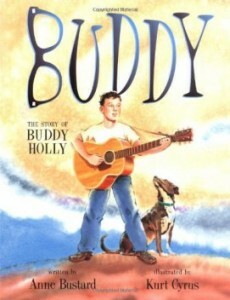 If I hadn’t taken that job, BUDDY: THE STORY OF BUDDY HOLLY would never have been published. Three years ago, I went on a writing retreat and I picked up a newsletter from a historical society. Inside was a quiz about the community. One of the unbelievably true facts about the town became the genesis for a manuscript I’m now working on. In addition, a wacky holiday display in my neighborhood now plays a role in the same story. If I hadn’t gone on that retreat . . . Earlier this year I had a big aha! when I reread Shutta Crum and Patrice Barton’s MINE! It’s resulted in a new picture book manuscript. Who knows what will happen to it, but it was a very satisfying breakthrough. If I hadn’t been prepping for a talk on revision for our SCBWI chapter . . . I was just living my life and these fabulous gifts from the universe appeared. I didn’t plan or foresee them. But I am a planner by nature and my intent is to make writing an everyday part of my life. A few weeks ago, all I had to show for my effort was one word change. But I was so happy, you’d have thought I’d solved a huge plot problem. Writing each days motivates me—feeds me—so that I write the next day and the one after that. Tell us about some of your accomplishments that make you proud. I am ever so thankful that I’ve followed my writing dream. It has not been easy or quick, but there continues to be much sweetness along the way. I love that former customers of my bookstore (which closed some years ago) still stop me in the grocery store (which happened last month at Central Market) to tell me that the store made a difference in their child’s life. Or when a former university student will ask me to sign a book at a conference (which happened last week at the Texas Library Association Conference) and say that they loved my class. I am most thankful that I had the privilege of caring for my parents when they were most vulnerable. I’m surprised and delighted by how fluid and ever changing it is. I love that our efforts are never lost, meaning that the work we discarded ten years ago was critical to the new work we did today, even if we can’t see how. Everything counts. Writer and teacher Tim Wynne-Jones posits that there is genius in our work. I’m going to go with that. That we leave clues for ourselves in our manuscripts that will lead us to the next revision. Hope. That no matter how dark, there is always light. Always.